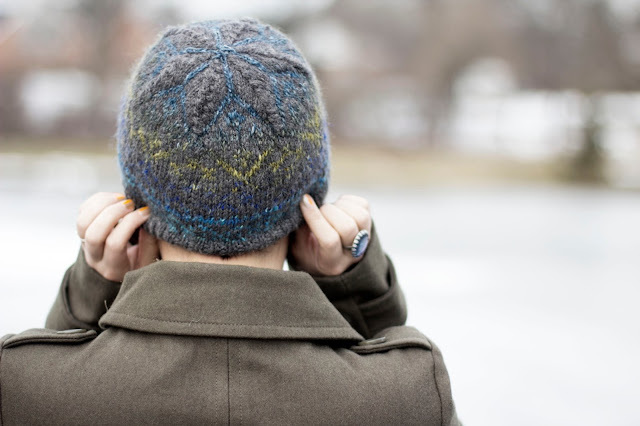 Let's be clear, I was really excited when eShakti contacted me for a product review. With serious a ton of cute animal themed dresses (which you know I love), I had trouble picking which dress I wanted and had to consult my husband on a choice. After debating over a great few dresses, we concluded that neckline on the Bird's Eye View dress would just be really great. Ordering the dress was really easy. I chose to go with a custom fit because I have always wanted to try it out. eShakti has a really helpful series of pop ups to help you with this, and they do work on the iPad which is awesome because I actually thought they wouldn't - I was wrong! The product came fairly fast - around a week after I ordered it. Problem - I wasn't there to get it. UPS made a mess of things to say the least (lost the package for awhile) but in the end, I got the dress to my house safe and sound. The dress itself is an amazing quality. The fabric is very nice (cotton for the win!) and the whole dress is lined. Plus, it has pockets! The fit was dead on except in the shoulders. I think that the straps are supposed to fall off the shoulders a bit as almost a sleeve, but when pulled down to fit, the dress was a bit low cut on me. I simply put the dress on, stuck a pin where I needed to shorten the shoulders a bit, and sewed a quick line with my machine. It's not a big deal to me to do this but could have been more difficult if I did not know how to sew. I think next time I may just try their standard sizing though as part of me wonders if I somehow messed up measuring my shoulders for the custom size. This dress is going to become a favorite that you will see again and again. I'll definitely be ordering from eShakti again because this dress is adorable beyond belief. The embroidery is adorable, the cut is great, and it's really comfortable. 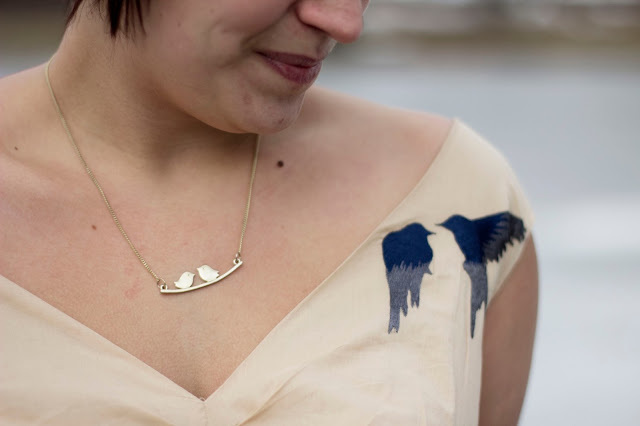 I wore this out on a lunch date and recieved quite a few compliments on the adorable birds. Plus - isn't it absolutely perfect with all my bird tattoo? Everything with animals, all the time. This post was sponsored by eShakti. This indicates I received a product in exchange for review, although the opinions and ideas expressed are my own. For more information - read the disclosure of this blog. Love the dress. The neckline is gorgeous and it has a great vintage vibe to it. 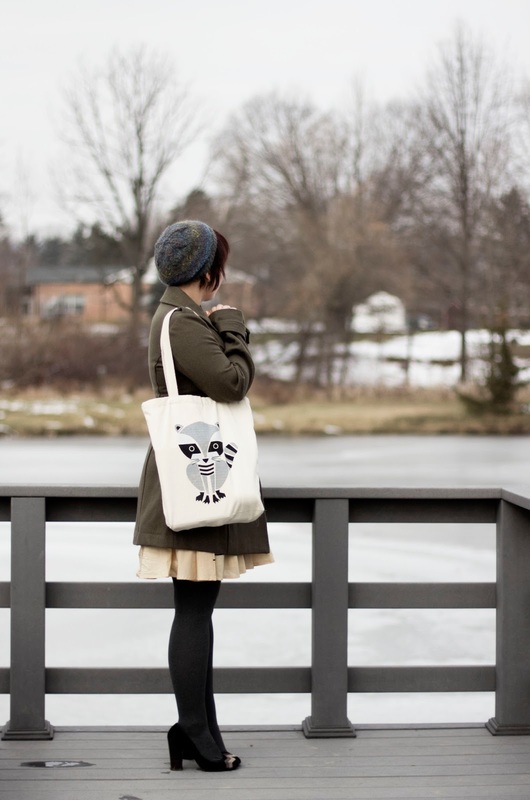 Also love your raccoon tote!! It's all about the animal prints. I adore this dress on you though - I've gotta say the pockets sell it for me immediately! I love a dress with pockets. I keep hearing great things about them so I'll have to check them out sometime! This dress looks amazing on you! I love eShakit, they are a really great company with very pretty dresses! That dress is absolutely adorable!!! I have to go check out Eshakati!! This dress is so adorable! I just ordered from them too and this dress was definitely on my list, but I decided on another. I'm glad you got this one though, so perfect for you! That neckline is really pretty, even if you did have to make some adjustments. Which brings me to my main point- thank you for a detailed and honest review that took us through your whole experience . It is good to know the ups and downs and doesn't reflect badly on the company at all. In fact, it makes me think even higher of eShakti, because if the shoulders were the only off thing about this dress that really impressed me with how great the rest of the dress must be. Plus, it looks really, amazingly cute! eShakti stresses me out. I have one dress from them that I adore. But I won a giveaway and ordered a dress, not a special order, and the dress they sent looks so CHEAP and oddly shaped. Their stuff always looks so cute online but I get a little scared ordering them. Nonetheless, this dress looks AMAZING on you. Like you said, lucky you can sew ;-) Maybe if I could sew I wouldn't be so freaked out! This dress is beautiful - one of my faves on you. I adore the dress eShakti sent me to review, and also highly recommend the site for dress shopping. Isn't eShakti just a way cool company?! Gosh, I had trouble picking just one dress, too, and I know I'll be going back for more, heheh! I'm suuuper glad that you love your purchase, Katherine! Seriously, it suits you to a T. Guess it's that custom fitting going on, huh? ;) Cute cute! I am a huge fan of eShakti. This dress is no exception. I love the print and the cut very much Katherine. It is very flattering on you. Can't wait to see how you style it in the future! I love this dress! The embroidery is my favorite part. I've been perusing eShakti for a while, but never made a purchase yet... now I might have to shop the site more seriously! Great choice in dress... it looks fantastic. Maybe it's just a thing with this particular dress and the custom sizing? Mine was weird in the shoulders and bust, too. Nevertheless, you look beautiful and styled it wonderfully! The top I received from them was a little small in the bust but I didn't do the custom sizing so I thought it was that? Anyway this dress is so cute! I love the little birds and it does go PERFECTLY with your cute tattoo. I love it! the dress is so cute and I love the fact that it's embroidery and not just a print! So cute! I LOVE that dress. The design is awesome. Love it - that is gorgeous. You're right about the neckline. I love EShakti! I got a bird dress for my product review too! 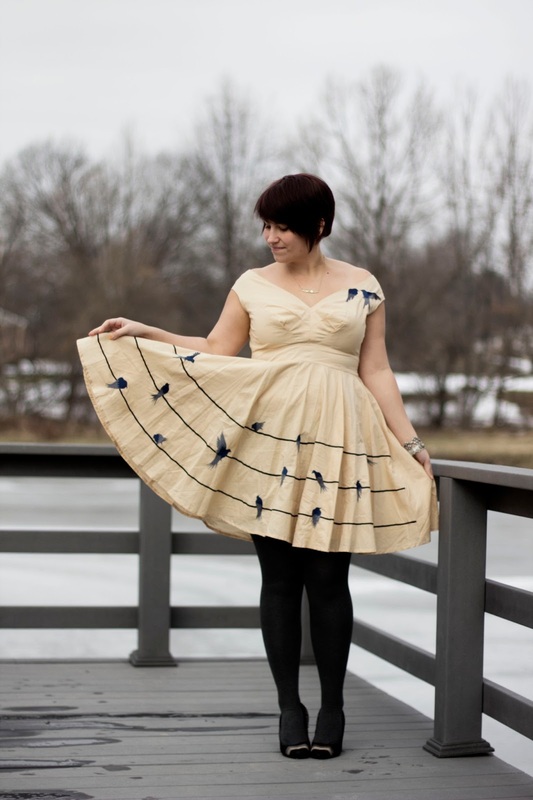 http://www.forthebirdsblog.net/2011/10/eshakti-dress.html. I kinda like yours better.. haha! Oh my god, I love that dress. It's so cute and fun. It looks really good on you! The dress is beautiful! It looks very good on you as well! I love the picture of you twirling. And oh pockets? Love dresses with pockets! I almost picked a wedding dress that had pockets from jcrew but ehh things happened and ultimately it didn't happen, but! dresses with pockets are the best! Your gloves are absolutely adorable...like I can hardly take it. And the dress is just so charming and clever, and has a wonderfully flattering fit. You look fabulous!!! 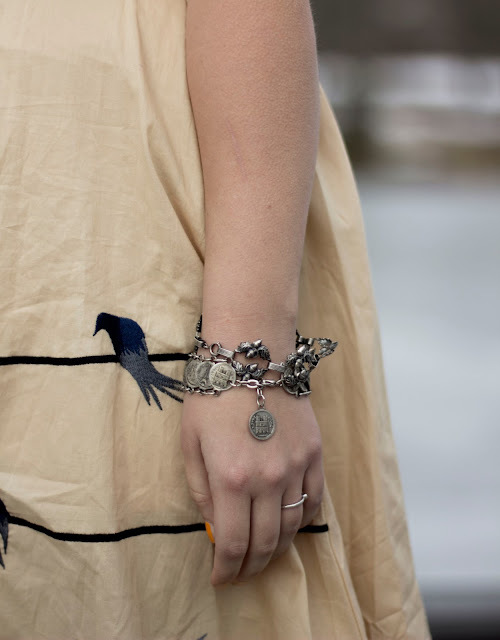 This dress is so adorable, I love the bird print! And the fact that it has pockets makes it even better :) i love all the animals in this outfit, hehe your necklace matches the dress so well! Absolutely gorgeous dress. I love the fact that they are embroidered on there, and I love the hew. That dress looks awesome on you Katherine. eShakti always does a great job. Love the bird motif. What a great dress! I'm a sucker for any animal print too :) It looks great on you and I love the whole outfit! Short sleeves in that weather? You are brave girl! Luckily you have the nice jacket and beanie to keep you warm. In love with the raccoon bag! pockets make every outfit better! Love this dress. It is so pretty and unique and I have a "sweet tooth" for unique outfits! That dress is absolutely amazing! And I almost got those same shoes from Target (they are gorgeous!). I almost got this dress! I love it! Our hair is totally the same length right now!